The black Digital Holster 40 V2.0 from Think Tank contains a unique "Pop Down" feature that allows the lens hood to be kept on the camera held in shooting position. For the active shooter, this is a real time-saver. 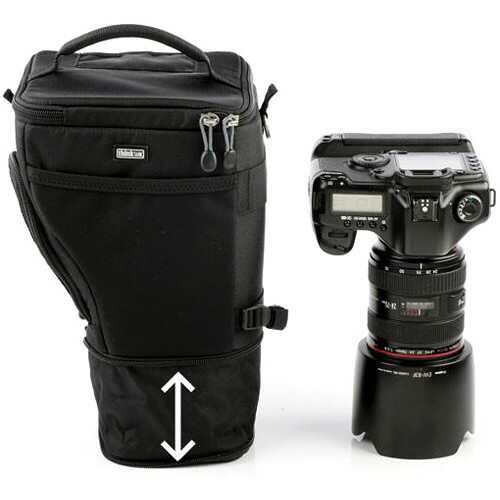 The case is made to hold a regular-sized DSLR such as a Canon 1D, 1Ds or Nikon D3, D4 with a 24-70mm f/2.8 with its hood either reversed or in shooting position. Your camera can also be placed in the bag with a tripod plate or L-bracket attached to it. Box Dimensions (LxWxH) 10.4 x 8.6 x 8.5"
Digital Holster 40 V2.0 (Black) is rated 4.4 out of 5 by 25. Rated 5 out of 5 by MC from Think Tank Photo Digital Holster 40 v2.0 On recommendation of folks at Think Tank Photo, I ordered the Digital Holster 40 v2.0 for my Nikon D810 with RRS L-plate and 16-35 mm lens. The Think Tank folks thought I would need the 40 size bag because of the L-plate on the D810, but there was too much extra room. The Digital Holster D40 size is really for a pro camera such as the Nikon D5. My camera was swimming in it. In the end I returned the bag and will be trying the Digital Holster 20 v2.0. I gave this bag 5 stars anyway because it's really well made with well thought out features and little extras like extra pockets for small items like batteries or memory cards. Rated 4 out of 5 by Jon from Great for pro/gripped body w/ long lens This is my first Think Tank purchase, along with the pro belt, harness, a couple of lens changers and a strobe pouch; about $300 all in. I bought this kit for hiking, but don't plan to use all attachments each time. The holster is very well made, and easily accommodates a pro or gripped body with a long lens mounted (hood reversed), when the pop down is extended. In my case, a Canon 5D or 5DIII with grip and a 70-200 f/2.8. The included shoulder strap is a nice touch, for using the holster without the belt. The size of the holster adds substantial width to my beam when mounted at the side of my hip; fortunately, the Think Tank system makes it possible to slide the holster around to the back of the belt when immediate access is not required. Rated 1 out of 5 by Timothy from Does NOT fit! According to the description, B&H states that, will hold a regular-sized DSLR such as a Canon 1D, 1Ds or Nikon D3, D4with a 70-200mm f/2.8 with itshood eitherreversed or in shooting position. It does not fit like it should in this case. B&H must not have the right description listed. I've emailed them, and once this is resolved, I would change my rating, because these appear to be very good holsters. Rated 5 out of 5 by Joe from The best holster bag I've had! I use the holster while backpacking attached to my shoulder straps. I also use the bag when I only want to carry a camera. I use it with a 5D mark II with a battery grip and there is plenty of room for my camera and cleaning kit. The best thing about the bag is that the zippers are high quality and I know this is not a quantified statement but it is a lot easier to get the camera in and out of this bag than other bags of the same type that I have had. Rated 3 out of 5 by Curt from good fit but extension feels flimsy Fits afull frame body plus vertical grip just fine. The zip open lens extension is handy but won't provide much impact protection. Rated 5 out of 5 by Frank from Efficient case for my Nikon DSLR This is a very solid bag for some of the larger Digital SLR Cameras. My D800 and it's battery grip fit with room to spare for memory, lens tissue, etc. The construction is very good and I was pleasantly surprised that it comes with a built in rain cover. I like the option of belt loop and/or strap for carrying. Perfect for me being that I carry my camera with me daily. Rated 5 out of 5 by Leo from Great bag, comfortable design. I use this bag for my Nikon D7000 with a battery grip. Currently I have a 35mm 1.8 lens with it, and it fits amazingly with tons of room for a longer lens. Possibly the best thing about this bag is the lack of that awkwardness you get from a full size bag. The one things that is bothersome though, is the lack of space for additional accessories, so if you want to carry another lens or a flash, you're going to have a hard time with this bag. Other than that, this bag is built like a tank, and is super comfortable! Rated 5 out of 5 by Ronald J from Perfect fit wit hthe correct ammenties! An extremely well made bag that my camera fits perfectly in. Very well make and the zippers are greaat also. My 7D MK II with the vertical battery pack and my 70-200 f/ 4.0 just fit this case. Exra padding will keep my camera safe! I would reccommend this bag to anyone!!! Are there any side pockets to hold filters , cleaning stuff etc? There is one side zip pocket, 1 filter in a case will be safe... two however will likely be a tight fit if you are packing a gripped body. Is there room for anything else inside the holster? Without using the extension (short lens), I can carry two more batteries there but with a long lens (using the extension), there is no room for anything else. Will this be able to fit a Canon EOS 70D with a Canon EF 70-300mm f/4-5.6 IS USM Lens? Will it fits the canon 6D with battery grip and EF 24 -70mm ? I use this case with a Nikon D3x and Nikor 24 - 70mm 2.8 lens and it works great.